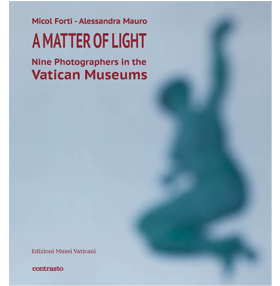 The book brings together the eyes of nine masters of international photography called to interpret the prestigious and precious uniqueness of the Vatican Museums. The book and the related exhibition derive from the intention to constitute the first photographic collection within the Contemporary Art Collection of the Vatican Museums. It is the first time that a Museum has commissioned a production of this type, aimed at constituting a new photographic collection inseparably linked to the museum itself, which becomes both its subject and its recipient. The relation of photography to art tends to be seen in two ways. On the one hand photography produces, and reproduces, images and knowledge of all the visual arts. Painting, sculpture, installation, performance, and so on. On the other, photography is an art in itself. Straight away, an antagonism seems clear: how can photography be a functional servant of the other arts while also being a means of subjective expression? Can the two roles ever be kept apart? And if not, what are the consequences for our uses and understandings of photography? It is as if Malraux is warning us, and himself, against photographic reproduction. But this passage appears early within The Psychology of Art(1947-1949), Malraux’s great three-volume photographically illustrated history of world art (later published as one book,The Voices of Silence).All of Malraux’s publications on art embodied the last moment of a European humanist conception in which the art and cultures of the centuries and continents are swept up and organised to construct the past out of the ideological needs of a European present. But those publications were also avowedly reflexive works of art history in their flaunting acceptance of the false terms offered by photographic reproduction. Behind this duality lay Malraux’s realisation that artworks are alreadyaltered fundamentally when they are plucked and placed in the museum. Photographic reproduction merely extends this alteration. It is telling then, that when Malraux turns finally to the possibility of photography itself being an art form, one that might find its own place in his musée imaginaire, his assumptions about the medium are shaped by the founding conditions of his project as a whole. For him, photography was a medium of the document “paralyzed by the fact that it had no scope for fiction; it could record a dancer’s leap but it could not show the Crusaders entering Jerusalem”. [vi]As such, he argued, it could only aspire to become an art through the synthesis of editing, finding its optimal expressive form in cinema. The argument is a cop-out, of course, on many levels, and not only because photographic art had been (and would again be) interested in depicting crusaders entering Jerusalem. [vii]Firstly, Malraux tries to keep photography out of his musée imaginaireif not on aesthetic grounds then for the sake of simplicity, excusing him from having to deal with the far more complex dialectic between artwork and document introduced by modern photography in the 1920s and 30s as it emerged in dialogue not with the crusades but with the medium’s mass cultural, documentary and vernacular forms. Secondly, ‘synthesis’ was just as significant for photography on the pages of magazines and books as it was for the cinema screen. Indeed, the books of Malraux himself, the supreme editor-magician, testify supremely well to this. His is an art history of singular images edited together. In many ways the art culture of the 21stcentury remains caught in the paradox that Malraux demonstrated so well. Our desire for an art of photography is at odds with our desire for photographs of art. But this was not always the case. The widespread use of photography as a means of reproducing artworks really took hold only in the last decades of the nineteenth century, and accelerated in the early 20th. Before then the relationship between photography as art and photography as documentation of art was much more fluid. It is worth recalling that first known photographic image was of a flat art work. In 1822, Joseph Nicéphore Niépce made a copy of an engraving of Pope Pius VII. It was later destroyed during an attempt to copy it, so we only have a written record of its existence, and no real sense of Niépce’s intentions. Was he thinking of photography as a form of interpretive copying, the way engraving or woodcuts based on artworks were understood? Or did he see it as something much more mechanical and neutral? Whatever the case, many of the other pioneers of the medium chose to photograph art works. [viii]Remarkable examples were produced by William Henry Fox Talbot, Louis-Jacques-Mandé Daguerre and Hippolyte Bayard, for example. In his publication The Pencil of Nature1844-46, Talbot included two very different photographs of his plaster copy of the classical Greek Bust of Patroclus. Each was taken from a different angle, under different light. Talbot wrote: “Statues, busts and other works of sculpture, are generally well represented by the Photographic Art […] These delineations are susceptible of an almost unlimited variety.” Talbot was demonstrating what the medium of photography could do, as a means of documentation andartistic expression. Between the 1840s and the 1880s photographing artworks, particularly sculpture, became a minor but important genre of the fast-emerging art of photography. This happened for many reasons. There were technical advantages in choosing to photograph things that did not move during the necessarily long exposures; white objects like plaster casts or marble statues seen against dark backgrounds provided tonal contrast for primitive photographic prints; turning an inanimate object or moving around it to find a pleasing vantage point attuned photographers to the play of light; and communing with objects that were already accepted by the academy as works of art could in principle help to elevate the art of photography. More significantly perhaps, making photographs of established artworks could be a way of clarifying, for photographers and audiences, the different qualities and characteristics of each medium. A photograph of a sculpture might tell us something about the sculpture, but it will also tell us something about photography. But what, exactly? About different paths to creation. About the different relationships between technique, craft and creativity embodied by each medium. About time. It is these clashes, between one medium and another, one time and another, one aesthetic order and another, that draw photographic artists to take up artworks as their subject matter. And while most often photographs of artworks are still made to be seen as documents, the fluid understanding that was there at the beginning of photography has never gone away entirely. The attraction between the camera and the artwork is too strong, and the possibilities too rich to be ignored. The work of the image makers commissioned as part of the Vatican Museum’s Matter of Light project testify to this. The approaches made by Antonio Biasiucci, Mimmo Jodice, Bill Armstrong have perhaps the most in common with their 19thcentury forbears. Each takes up their chosen artworks (sculptures, paintings) as aesthetico-philosophical objects. Others, such as the very different Alain Fleischer, Rinko Kawauchi, Peter Bialobrzeski, Massimo Siragusa, and Martin Parr are more interested in the ways in which the museum itself is an artwork that stages for its audience the artworks that it presents. But all of the photographers commissioned are exploring what happens in the encounter between one medium and another and, just as importantly, between the artwork and the viewer. Of course, there is not really such a thing as ‘the’ viewer. The days of the ideal spectator are long gone, if they ever existed at all. Very little can unite the experience of a contemporary audience standing before an artwork, whether that artwork is the ceiling of the Sistene Chapel or a photograph of someone looking at it. The diversity of strategies and images that make up Ex Phototestifies to this. If there is no ideal viewer, there is not ideal view. If there is no ideal view, then we need many views. And the needing of many has become the key to art in the 21stcentury. [i]Edwin Smith, ‘The Photography of Paintings, Drawings and Print’ in John Lewis and Edwin Smith, The Graphic Reproduction and Photography of Works of Art (Cowell and Faber, London 1969). [ii]Man Ray, Self-Portrait(André Deutsch, 1963). [iii]Walter Benjamin, ‘A Small History of Photography’ (1931), in One Way Street and other writings, (Verso, 1979), pp. 240-257. [v]Gisèle Freund, Photography and Society (Godine, Boston, Mass. 1980) p. 224. Eventually many different photographers were commissioned to make the images for Malraux’s publications. [vii]I am thinking of forms of staged and montaged photography explored in the 1870s and which then reappeared on very different terms a century later in the work of Jeff Wall, Cindy Sherman, and many others. [viii]See Anthony J. Hamber, ‘Photography of Works of Art’ in Jacobsen, Ken & Jenny, Etude D’Apres Nature. 19th Century Photographs in Relation to Art, Ken & Jenny Jacobsen, 1997. [ix]Denis Hollier, ‘Beyond Collage: Reflections on the André Malraux of L’Espoirand of Le Musée Imaginaire’, Art Press, no. 221, 1997.